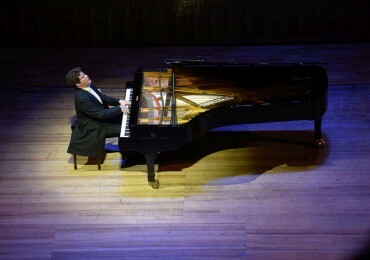 The Second Piano Concerto, which on Sunday benefited from the iron-man keyboard prowess of pianist Denis Matsuev, comes tearing out of the gate as if on steroids and doesn’t take a breath until its three movements are complete. It covers a lot of ground, too — stentorian twelve-tone writing in the first movement, a sudden burst of bebop piano that crops up (uninvited but hardly unwelcome) in the finale, and in between, more ferocious passagework than most composers would pack into three concertos and an encore. The piece is hard to swallow at first, but before long its manic energy and eagerness to please — even if that means turning somersaults right into your lap — win you over. There’s an echo of Prokofiev’s acerbity and tangy wit in there, but Shchedrin’s voice is far more extroverted and ingratiating.